Background: There is a rapidly growing interest in the development of nanoparticle drug delivery mainly for anticancer drugs as it promises to solve several problems associated with anticancer drugs such as poor water solubility, low therapeutic index, nonspecific distribution and higher systemic toxicity, etc. Objective: The objective of the study was to investigate the effect of various critical variables like, concentration of chitosan, concentration of sodium tripolyphosphate (STPP) and volume of STPP on various characteristics of gefitinib loaded nanoparticles. 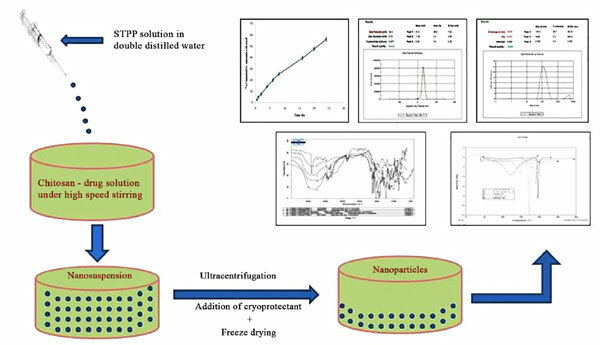 Methods: Thirteen formulations of the polymeric nanoparticles were prepared using various concentrations of chitosan (0.1-1% w/v), STPP (0.2-1.5% w/v) and different volumes of STPP (8-20 ml) by ionic gelation method. Mannitol (5% w/v) was used as cryoprotectant. The prepared nanoparticle formulations were characterized for various parameters like particle size, zeta potential, process yield, encapsulation efficiency, drug content, and in vitro drug release. Results: The nanoparticle formulation NF-1 containing 0.1% w/v of chitosan and 10 ml volume of 0.2% w/v STPP showed best results in terms of particle size (123.8nm), polydispersity index (0.247), zeta potential (+30.4 mV), process yield (68.09%), drug content (74.32%), encapsulation efficiency (70.52%) and released (56.2 %) drug over a period of 24 h. The in vitro drug release analysis showed sustained release of gefitinib from nanoparticles and followed Korsmeyer-Peppas model. Conclusion: The nanoparticle formulation with desired characteristics can be prepared at low concentration of chitosan and STPP along with low volume of STPP. The formulated nanoparticles may prove to be the best option for the treatment of cancer. Keywords: Chitosan, gefitinib, ionic gelation method, mannitol, nanoparticles, sodium tripolyphosphate (STPP). Keywords:Chitosan, gefitinib, ionic gelation method, mannitol, nanoparticles, sodium tripolyphosphate (STPP). Abstract:Background: There is a rapidly growing interest in the development of nanoparticle drug delivery mainly for anticancer drugs as it promises to solve several problems associated with anticancer drugs such as poor water solubility, low therapeutic index, nonspecific distribution and higher systemic toxicity, etc.